Step 1. Clean and peel the potatoes, roughly dice them, bring them to the boil in well salted water. Cook for 10 minutes or until they readily break apart when crushed. Drain and dry them well before either mashing or pushing through a fine sieve. Step 2. Bring a pan of well seasoned water to the boil, add the stinging nettles and blanche for 10 seconds, remove immediately and refresh in ice cold water. Squeeze out any excess liquid from the nettles, (even press them in a tea towel) before finely chopping. Step 3. Add this to the mashed potatoes, together with the flour and the flax mix, the olive oil and the seasoning. Gently combine together using a spatula being careful not to overwork the starch in the potato. Step 4. Roll out the mix on a floured surface into even elongated tube shapes (1.5cm diameter sausages) and cut them up into 4cm pieces. Step 5. Bring another pan of water to the boil and blanch the gnocchi until they float - around 1.5minutes. Remove and place on a tray while you make the sauce. Step 6. Sweat the onion and the hogweed stalks in olive oil and season with salt and pepper, cook until softened. Step 7. Then add in the roasted garlic (should be the consistency of a puree) and almond milk bringing up to the boil. Step 8. Next, add the hogweed leaves and the kale, let them wilt down for a minute or so, checking the seasoning. Step 9. Pan fry the gnocchi in a dash of olive oil. 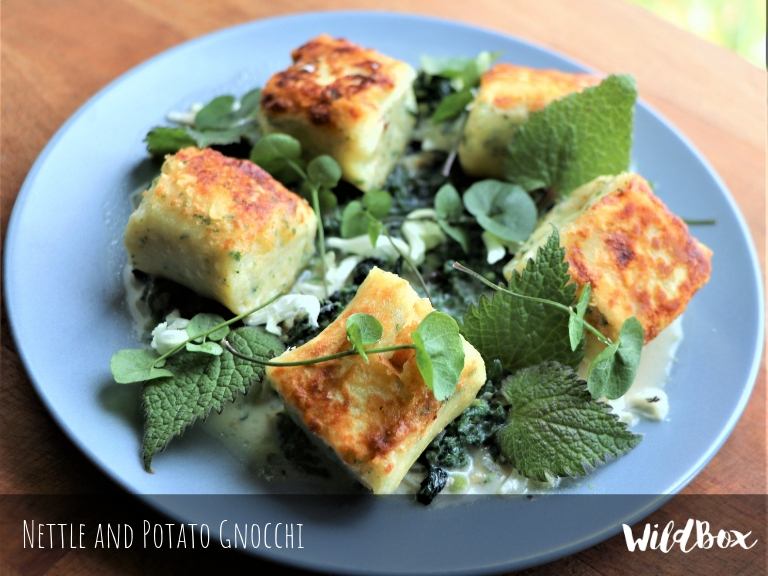 Serve the gnocchi on top of the sauce and garnish with the lady’s smock and white nettle leaves and flowers.